World-renowned construction and agricultural equipment company JCB opened a new brand experience at its headquarters in Rocester, England. 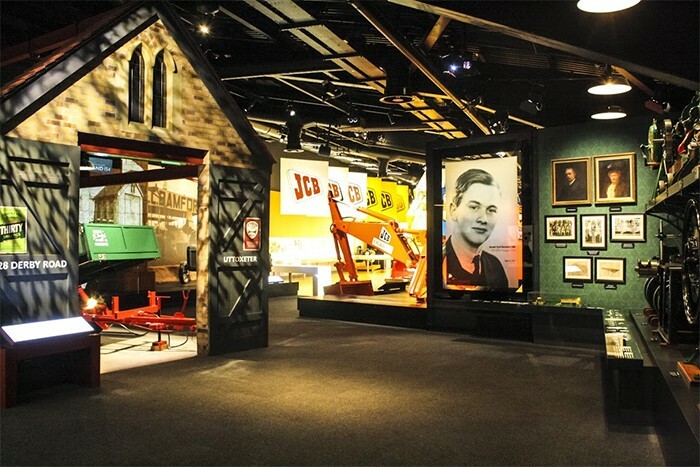 Electrosonic was on board to support the integrated AV presentations that play a key role in helping visitors interpret "The Story of JCB." As the AV systems integrator, Electrosonic continued a very long association with JCB, which goes back some 40 years. Designed by Studio MB, the customer attraction – which combines a museum, a showroom and an immersive exhibition with brand promotion – is primarily targeted to the company’s sales efforts. JCB headquarters receives some 15,000 customer visits annually from all over the world, and this number is expected to increase as a result of the launch of "The Story of JCB." The 25,000 square-foot installation is housed in the former JCB Design Centre and showcases 16 vehicles of all vintages. The company’s origins date back to 1820 as Bamfords Agricultural Engineers. Joseph Cyril Bamford (Mr. JCB) brought the company into the modern era after military service in WWII. The Early Years exhibition includes a corrugated iron "barn wall," which acts as a projection surface for a film about the early years in the post-war era. Stacked bales of straw also serve as a projection screen for visuals alongside a single-arm hydraulic loader that fits on most tractors – a very successful product for JCB. The next part of the exhibition depicts how JCB was built up as a brand and features one of the celebrated "Dancing Diggers", a famous aspect of JCB’s product introductions which were used to perform intricately choreographed moves showing off the product’s versatility. A digger in mid-dance frames a screen presenting a video on brand development. Exhibits on the Loadall telescopic loader and the 110 crawler digger explain the evolution of their design, and include a localized soundtrack fed through four overhead loudspeakers triggered by a break-beam sensor. The Global Expansion zone looks at JCB’s 22 plants around the world. The company’s international activities are projected onto a hemisphere set into the floor. Individual exhibit tables with built-in LCD screens detail the activities of some of the principal units. An LED ticker overhead displays statistics. A full-size wireframe model of the JS200 tracked excavator, made from 8mm steel rods and weighing two tons, is a striking introduction to the exhibit "Our Largest Vehicles for the World’s Largest Projects". A nearby screen displays a video on the excavator and JCB’s other heavy equipment. Opposite the JS200, a three-ton JCB Fastrac chassis is suspended over a nine-screen videowall located in a raised bed on the floor. It displays a video about the pioneering chassis design and the products based on it. A curved wall comprised of crates of spare parts acts as a projection surface highlighting the company’s worldwide parts and service organization. Another exhibit explores products for the military and includes visuals of the products in action. More AV elements come into play for the exhibit on diesel engines and the super-sleek JCB Dieselmax car, which holds the world speed record for a diesel-powered car at 350 mph. A panoramic screen behind the vehicle displays its record-breaking run on the Utah salt flats. In the awards section, a rear projection screen shows the many distinguished visitors to JCB, including prime ministers and royals. "The Story of JCB" concludes with the Wonderwall, which is formed by a line of four 46-inch LCD screens. 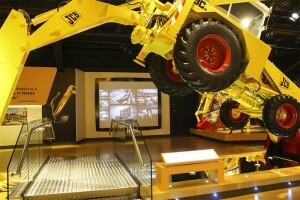 In interactive mode, the displays perform like an animated card index of JCB products; at other times, they scroll through images of JCB products. Customers typically take a guided tour of the exhibits with guides using Apple iPods to trigger installations. The shows can also run automatically in sequence or play as continuous loops with no formal visitor control. The entire AV system can be controlled from simple touch panels at the exhibition entrance and exit. The password-protected controls can fire up or shut down the whole system and select the mode of operation. Electrosonic opted to standardize the AV equipment throughout the installation as much as possible. 7thSense Delta Nano servers replay video for the loader, Global Expansion and Parts and Service displays, where irregular screen shapes require some geometry correction. A 7thSense Delta Duo server replays video for the Dieselmax car exhibit, which requires both edge blending and synchronized playback. All other video playback is from Brightsign HD220 units, some of them located adjacent to the displays and controlled by LAN using powerline plug-in adapters. In all other cases, video distribution is over CAT 5 cable using DVI extenders. Electrosonic chose an Optoma projector for the introductory "barn wall" screen. All other projectors are high-output, single-chip DLP Christie projectors (models DHD670-E, DS+750, DHD800) with light outputs in the range of 5800-8000 lumens, and accommodating both HD and SXGA formats. NEC 46-inch LCDs are deployed in the Wonderwall and in the videowall under the Fastrac chassis. Winmate open-frame 21-inch LCDs are built into display counters. Source and control equipment is located in three racks alongside the exhibition to minimize cable runs. Within each rack, audio from the media players is fed to an AMX Precis DSP, and then to Cloud multi-channel amps in a mixture of 4- and 8-channel units. Exhibit loudspeakers are primarily from the Tannoy Di range (models Di 8DC, Di 6DC, Di 5DC). The entire AV system is controlled by an AMX NI-900 integrated controller; all devices are connected to it through a LAN. In addition to the small control panels previously cited, full control and monitoring of every device is available from a master control built into the main AV rack and from an AMX MVP-9000i wireless control panel. These panels can only be operated by authorized maintenance personnel. Studio MB of Edinburgh was the design and build contract lead. Exhibition fit out was performed by SharmanShaw Exhibitions Ltd. of Leeds. Lighting design was by Nich Smith of Glasgow and the electrical contractor was Andrews Electrical of Burton on Trent. AV content was written and co-designed by Studio MB, and co-designed and produced by ISO Design of Glasgow. Quadrille Media Ltd. of Edinburgh encoded the content. The AV consultant for the project was Edinburgh-based Douglas Bolton.